Trees enhance our homes and provide shade and privacy. But trees may contact powerlines and interrupt power supply during storms and high winds. To help prevent this happening, and to ensure the safety and reliability of your power supply, you need to plant smart. For the service line, the one that connects power to most homes, trees can safely grow quite close, even brushing it lightly, and not cause a problem. Report trees or vegetation touching or growing too close to powerlines or power poles by calling us on on 13 74 66 (7am - 5:30pm, Mon to Fri). Always remember - Never attempt to trim trees or other vegetation near powerlines yourself. Call a professional tree trimmer to trim any trees near powerlines. Download our Trees and powerlines flyer (PDF 1.2 mb) to read more. Consider how high and how wide your tree will grow. If planting near powerlines, choose a low-growing, powerline-friendly species. Check our Plant smart search for powerline friendly plants in your council region. Plan where you are going to plant. Plants must be at least three metres from power poles. Plant shrubs or small trees one metre inside the kerb where the council footway is a minimum of four metres wide. Allow for at least a two metre gap between the service wire to your home and the height of mature trees. If your tree will grow to five meters, you should plant it five meters away from the power pole. If it will grow to ten meters, it should be ten meters away. Keeping trees away from powerlines helps keep the power on and you safe. Check with your council for planting guidelines, especially if planning to plant on your council footway. Residents who wish to plant trees on council-controlled land in locations other than streets or council footways, may need written permission. Consider the location of overhead and underground services, including the service line to your home. Call 'Dial before you dig' on 1100 to request information about underground cables on or near your property. Check the visibility from your driveway, intersection sight lines and access to your property. Consider pedestrian traffic, mail service and garbage truck access. Check required clearance from street lights. Consider which type of tree you should plant. Choose a powerline-friendly plant. Check with your local plant nursery or council for recommendations. 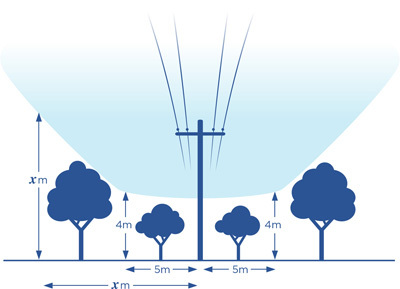 The diagram below shows the recommended minimum distance between a pole and a grown tree, and the desired maximum grown height of trees under powerlines. Once planted, water the tree regularly in dry weather (check under the mulch to see if the soil is dry). Even so-called drought-tolerant plants need to be watered regularly until their roots become established. Native trees can be fertilised for much better growth. Use a fertiliser that is low in phosphorus, marked as ‘P’ on the label of the bag. To determine if your fertiliser is suitable, check the N:P:K (nitrogen - phosphorus - potassium) composition. Use one that contains less than 3% P; those with low P but high N and K are fine, e.g.11:2:13. Some trees just aren't suited to growing near powerlines. Trees which grow fast and tall are the most hazardous, as well as those which tend to drop large branches during storms. If a plant is assessed as posing a risk to electrical safety or power supply, our contractors will negotiate with the landholder to remove it. Pepperina/Peppercorn tree (Schinus molle var. areira.). Pink trumpet tree (Tabebuia impetiginosa).